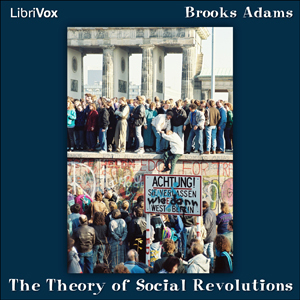 Listen to "The Theory of Social Revolutions" on your iOS and Android device. Brooks Adams (1848-1927), was an American historian and a critic of capitalism. He believed that commercial civilizations rise and fall in predictable cycles. First, masses of people draw together in large population centers and engage in commercial activities. As their desire for wealth grows, they discard spiritual and creative values. Their greed leads to distrust and dishonesty, and eventually the society crumbles. In The Law of Civilisation and Decay (1895), Adams noted that as new population centers emerged in the west, centers of world trade shifted from Constantinople to Venice to Amsterdam to London.